Having a child with special needs can bring great joy to a family, while also presenting great challenges. When a child is born with special needs, it’s never too early to begin the process of planning and preparing for their future. Based on your family’s unique circumstances, an attorney who focuses on helping those with special needs can help you determine how much money your family should plan to allocate towards providing care for your loved one, as well as offering strategies for meeting those needs. Read on to learn about the basic tools that you should consider using when planning for the future of your special needs child. Special needs trusts provide support without threatening public benefits: In order to remain eligible to receive public benefits such as Supplemental Security Income or Medicaid, persons with special needs may not have more than very minimal assets to their name. However, these benefits are rarely enough to cover the extensive costs of life as a person with special needs. A special needs trust will allow a family to set aside assets for a person with special needs to use for their care, with payouts determined by a trustee of your choosing. The trust may be a first-party trust, funded with assets given to the beneficiary directly (such as an inheritance or award from a personal injury lawsuit), or a third-party trust, funded by family members or a life insurance policy. ABLE accounts allow tax-free saving: ABLE accounts allow persons with a disability arising prior to age 26 to save money tax-free. For an individual who is able to work, these accounts can be a valuable way to save without losing access to public benefits (so long as the account owner does not contribute over $14,000 to their account). The account-holder can also spend ABLE account funds tax-free on a broad range of qualifying disability-related expenses. A letter of intent can help guide future caregivers: Creating a letter of intent, also known as a letter of instruction, offers parents and caregivers a chance to explain their loved one’s medical or developmental condition to a subsequent caregiver, should the current caregiver be rendered unable to provide care for some reason. Caregivers can explain what sorts of events or conditions are problematic for their loved one, any allergies they may have, even how they communicate with their special needs child or loved one. 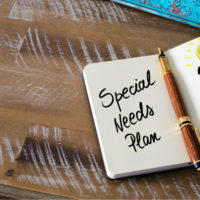 If you need assistance creating a Florida savings and support plan for your special needs child or loved one, contact the professional and compassionate West Palm Beach special needs planning attorneys at Shalloway & Shalloway for a consultation, at 561-686-6200.